This text starts the story fragment - just this one chapter - that deals with Y'hudah's marriage, the birth of his sons and grandsons, including his relationship with Tamar, his daughter-in-law and the mother - with him - of his grandsons/sons. The whole chapter is only thirty verses, yet must span some fifteen to twenty years, inserted into the main narrative of the Yosef story which immediately picks up in the following chapter. Naturally, the insertion of this important piece of story - for from the union of Y'hudah and Tamar would eventually come King David and, of course, Messiah - at this point has attracted the attention of the commentators. Rashi asks, "Why is this passage juxtaposed at this point - interrupting the story of Yosef?" He answers that the key word is , "and he went down", from the root , which means to go down or descend - the opposite of the root , to go up or ascend. While these verbs are often used in a very physical way: going down to Egypt, going up to Bethel, they always have a spiritual under-thread running through them. Jerusalem, in the mountains of Judea, while not the highest point of altitude in the whole land of Israel, is certainly among the highest points physically in Judea; it is also seen as the highest spiritual place in the Land, so that pilgrims would come up to see the House of the L-rd, go up to Jerusalem, from all over both the Land and the world, to seek the G-d of Israel. As they ascended physically they also ascended to a holier place and a higher level of holiness. Returning home reversed the process as they went down. This sense is preserved in the modern words "aliyah", to immigrate to Israel and "yeridah", to emigrate from Israel. But why did Y'hudah go down from his brothers? Rashi continues, "To teach that his brothers took him down from his position of leadership in the family when they saw the distress of their father." The brothers held Y'hudah responsible for his idea of selling Yosef to the Ishmaelite/Midianite traders and then telling Ya'akov that his favourite son had been attacked and killed by wild animals. Because of his obviously (with hindsight) bad judgement, his brothers now looked down on him and probably spurned him. The text goes on: "he turned away to an Adullamite man named Hiram" and the following verses relate that he married out - a local merchant's daughter - and lived apart from his father and brothers for enough time to have two sons and arrange a local marriage for them also. This teaches us two things. Firstly, that sin causes a separation and a barrier, not only between men and G-d, but also between men and within families. Secondly, one sin inevitably leads to another unless G-d intervenes to stop the process. As Rav Sha'ul wrote: "For sin, seizing the opportunity afforded by the commandment, deceived me; and through the commandment killed me" (Romans 7:11, CJB). So from Y'hudah's one sin came a distancing, a cooling of relationship, followed by a turning away, a breaking of fellowship and regular contact, leading to the other events of the chapter: the sin of his sons, not honouring his commitment to his daughter-in-law, consorting with a prostitute, being unable to redeem his pledge to pay the prostitute, condemning his daughter-in-law to death for becoming pregnant without a husband, until finally he stood up to his failures and admitted his part. Application: Are you on the edge of a slippery slope of sin away from G-d, your family and those close to you? 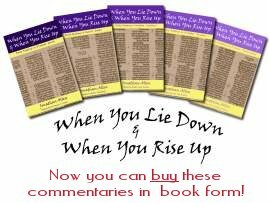 Even if you have already started "going down" it is never too late to acknowledge what is going on and call out to G-d to help you. "Everyone who calls on the name of the L-rd will be saved" (Romans 10:13, NASB).